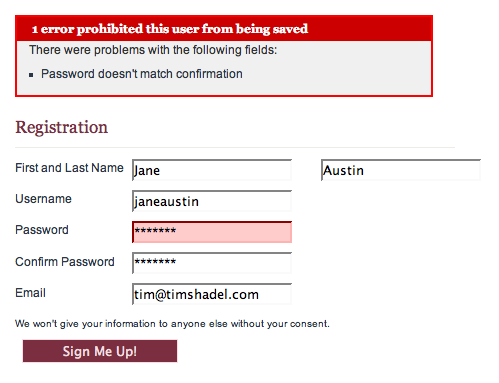 This morning I experimented a bit with overriding the default HTML generated by validation errors in Rails. Instead of wrapping the <input> tag inside a <div class="fieldWithErrors"> indiscriminately (which was breaking the layout I wanted), I wanted to simply inject a new CSS class onto the HTML element. The layout I had before is completely preserved, and I have the chance to color the input the way I want. I haven’t tried it with a <textarea>. Also, I tried to adjust for the possibility of other CSS classes already existing on the element, but I’ve only checked it in irb. Let me know if you’ve got improvements to this approach; I’d love to hear ‘em.